As mentioned in the "Web 0.x to Web 2.0" post, outside of IM (instant messaging), voice chat and voice-video chat, and some illegal P2P (peer to peer) file sharing software, most Internet applications are still based on a traditional "Client/Server" model that is analogous to the "Browser/WebServer" model. While today’s Web applications have dramatically improved their user experience and community aspect, this "Client/Server" paradigm brings some unfortunate limitations to technology providers and users. I am sometimes among those who use too many buzzwords, and consequently get some grief about it. However, I think I have a valid excuse. 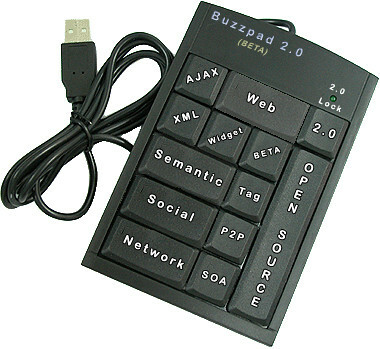 A few months ago, realizing that there was no way to escape buzzwords in this industry, I built myself the following "Buzzpad". It is growing on me, probably a little too much. To pre-order the Buzzpad 2.0 (BETA), just digg-it. USB 2.0: For high-speed buzzwords transfer. Windows, Linux, Mac: For cross-platform buzzing. 2.0 Lock: Automatically adds the "2.0" to any appropriate technology words (e.g. Web 2.0, Identity 2.0, Internet 2.0). Microsoft Office "Smart" tag integration: Will vibrate when a buzzword could be added. Blog Integration: With an "OFF" button to prevent users from entering a buzzword when commenting or blogging. Bluetooth: To extend the Buzzpad to mobile phones and other mobile devices (for pervasive buzzing). Support this project by digging it up. SSE adds an overdue functionality to the Internet: Synchronization. SSE is just an extension to open protocols (RSS & OPML) and not another XML protocol. SSE is designed to be as SIMPLE as its "host" protocols (RSS & OPML). Microsoft seems to be fully committed to promoting and supporting this new protocol (probably thanks to Ray Ozzie). Proof of concept seems to be up and running at Microsoft. The technology is available under an open licensing agreement (Attribution-ShareAlike from Creative Commons and is "patent friendly". From Microsoft SSE Specification: "As to software implementations, Microsoft is not aware of any patent claims it owns or controls that would be necessarily infringed by a software implementation that conforms to the specification’s extensions. If Microsoft later becomes aware of any such necessary patent claims, Microsoft also agrees to offer a royalty-free patent license …"
This protocol-extension is a great addition to RSS and OPML. The distributed nature of the Internet architecture requires such a multi-directional synchronization mechanism. Unfortunately, it has been a great challenge to find the right balance between simplicity and completeness for such protocols. Ray Ozzie’s expertise (with Notes & Groove) and dedication create a high level of user confidence in this new proposal. As Ozzie mentioned, while there are plenty of synchronization protocols available (inside and outside of Microsoft), they have not been utilized as much as they should have been. Their complexity might have been a primary reason. For example, SyncML, while a very successful protocol, has seen some challenges to its objective of growing beyond the PIM space. So far, the buzz from this proposal has been pretty positive. Dave Winer gave some good background information on his blog on November 21st. Mike Arrington from TechCrunch sees some new business opportunities for product development. Another good explanation of the technology can be found at gabbr.com. Again, this shows Microsoft’s determination to catch this new Internet wave. It is also enlightening to see how the Internet evolution seems to cause "corporate technologists" to realize that simplicity often overcomes completeness. Microformats vs OWL/RDF, PHP vs .Net/J2EE are other examples of this inevitable Internet simplification phenomenon. It will also be interesting to see how “SSE” will play with other standards such as SyncML, CalDav, and other XML protocols. Synchronize Flickr sets with phpGallery albums. Provide access to "distributed NotePad" ("NetPad") which will keep my personal notes in sync across devices, desktops and online services. And obviously, allow me to share my "family calendar" with my wife. However, I will need to buy her one of these new digital paper notebooks. In the early days of the Internet, innovators and venture firms were equally important forces behind the internet evolution. At the time, most Internet ideas needed some external funding to get started. Consequently, ideas often started with the now infamous PowerPoint presentation to the VC. If ideas were accepted, most first round funds were devoted to building the proof of concept and generating enough buzz to acquire a user base. As a result, venture firms played key role in choosing which idea or group of people would start or not. Although this model has created some great Internet companies (Amazon, Ebay), it also created the dot-com saga that we know all too much about. Even for companies with good ideas, putting the “Buzz before the Bits” could be very costly. Recently, users have been bombarded with new types of Web applications often referred to as "AJAX Applications." From an end-user point of view, these Web applications add a new level of interactivity, which was previously the domain of desktop applications. Some good examples of AJAX applications are GMap, Google Suggest, Interactive Domain Search, and Windows Live. On the technical side, AJAX is a term describing an approach at developing more interactive Web applications. Although AJAX might look like new technology, AJAX technologies have been around for a while. So, what made AJAX such a sudden phenomenon? And, why now? The natural first explanations are technical. One could say that browsers were not powerful and flexible enough to support these types of applications. However, most of the AJAX applications run on Microsoft IE (MS-IE) 5, which was released in 1999. Mozilla 1.2, the first robust modern browser, was released in 2002. Another argument is that the PC has become more powerful and therefore, has enabled users to take advantage of these new processor-demanding applications. However, AJAX applications do not consume that much processing, and the end-consumer PC market has not evolved as fast as the popularity of these new applications. A name (AJAX): Jesse James Garrett did a great job at naming and describing an approach to building new Web applications. This has allowed the industry to have a common understanding and terminology about these technologies. The perception of feasibility (Firefox): MS-IE 5.0 was too Windows-centric to be the only bet for mainstream Web spplications and Mozilla 1.2, while sufficient, was not recognized as a valid alternative. Consequently, the majority of the Web stayed with the lowest common denominator. Fortunately, the fulgurant Mozilla Firefox popularity growth reestablished developer confidence in MS-IE alternatives and "re-balanced the Web" toward standards and true cross platforms. Proof of concept (GMap): One of the most future-looking internet companies, Google, released a dazzling mapping "AJAX" application to the public (GMap). This was the best validation of the AJAX approach… probably to date. It was fascinating to witness these three events happening almost in perfect harmony. I guess it was such a needed evolution that everybody naturally did their part of the puzzle. In any case, this new approach is a much needed update for many current Web applications. It will interesting to see if the innovation will come from the incumbent or newcomers. So far, with the exception of Google, most of the real innovation in this space has come from startups. However, with Yahoo and Microsoft in the race, this might change. Honestly, AJAX does not solve all Web application limitations. For example, Offline, Desktop Integration will still require some sort of plug-ins…which are very browser dependent…there is no free lunch…except at Google, I guess.